We are pleased to announce that the 2018 Toyota C-HR has arrived in Rochester, NH. This all-new Toyota Coupe High-Rider is unlike any other SUV or crossover in our inventory. The new Toyota C-HR is offered as either the XLE or XLE Premium model with a choice of nine exterior colors, including several two-tone choices. The unique precision-cut, diamond-like exterior styling is aerodynamic and a bit edgy. Interior styling is sleek and sophisticated with specialty items like premium leather-trimmed steering wheel and a satin plated shift knob. This new Toyota model affords ample passenger space and versatile cargo storage, courtesy of its standard 60/40 split rear seats. 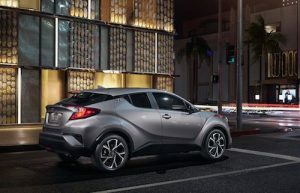 Powered by a 2.0-liter inline 4-cylinder Dynamic Force Engine with Toyota’s Valvematic technology, the new C-HR offers superior handling performance and fuel economy. Driving enthusiasts will enjoy the sport-tuned suspension and Continuously Variable Transmission with Sequential Shiftmatic Model for manual shifting between seven gears. The new Toyota C-HR is well equipped with safety features such as10 airbags and advanced technology including the Star Safety System with Vehicle Stability Control, Traction Control, Anti-lock Brakes, Electronic Brake-force Distribution, Brake Assist and Smart Stop Technology. Beyond the revolutionary styling, performance and safety features the most appealing feature of this all-new Toyota is its price. The 2018 Toyota C-HR has a starting MSRP of $22,500. Compared to other new vehicles such as the 2017 Mazda Cx-3 (Grand Touring FWD) at $25,930 and the 2017 Honda Hr-V (Ex-L CVT FWD w/Navigation) at $25,880, the new Toyota C-HR is as affordable as it is revolutionary. We invite you to learn more about this exciting new member of the Toyota family. Our Rochester Toyota Dealer sales team is on standby to help you explore standard and available features, trim levels, color options and more.